Inclined pressure reducing valve with compression ends. Max. upstream pressure: 16 bar. Downstream setting pressure range: 1–5,5 bar. With pressure gauge: 0–10 bar. Inclined pressure reducing valve. For high temperature. Brass body. Inclined pressure reducing valve for safety group. For high temperature. Dezincification resistant alloy body. Inclined pressure reducing valve. For high temperature. Brass body. With pressure gauge. 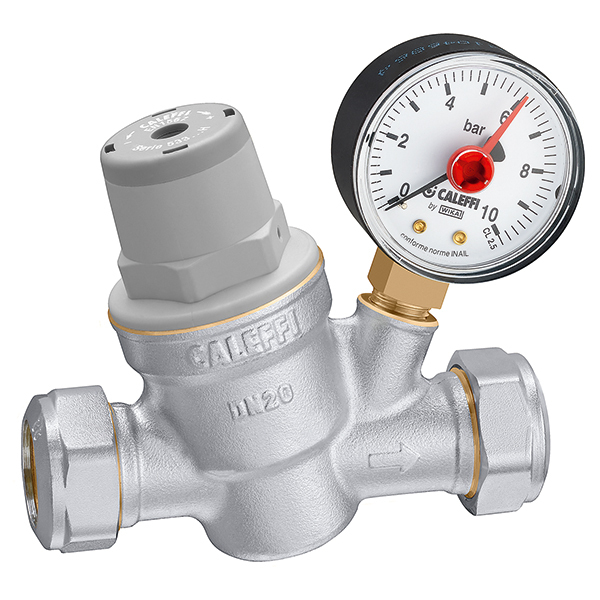 Inclined pressure reducing valve - high temperature. Brass body. With pressure gauge connection. Inclined pressure reducing valve with compression ends. For high temperature. Dezincification resistant alloy body. Inclined pressure reducing valve with compression ends - high temperature. With pressure gauge connection.